Observation - A heron finding a sunny spot - UK and Ireland. Description: This heron was on the bank of the small, secluded Cloudy Pit lake when the sun at last shone.This lake has lots of reed bed and is away from the busier lakes at the Reserve. 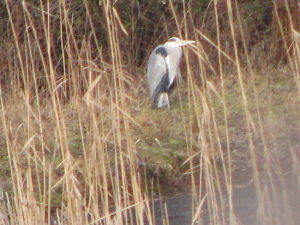 This heron was on the bank of the small, secluded Cloudy Pit lake when the sun at last shone.This lake has lots of reed bed and is away from the busier lakes at the Reserve.